Old houses have a way of making themselves dirty, they crumble pieces of rusty radiators and cracking tile grout. My husband and I rent a place like this. In beams of sunlight, I can track fuzzy dust trails intertwined with all kinds of hairs and particles from disintegrating flooring. Clumps cling to the baseboards and slip under doorways, blown by invisible air currents. After living here for well over a year, certain quirks get my particular attention. I can get quite distracted by the kitchen flooring, a 1980s white linoleum that turns mop heads and rags black, even on the tenth scrub. The dirt captured by its textured surface has been sealed in by grease and time, yielding just enough to fool me into thinking I’ve made progress by attacking it on hands and knees. Under the cabinets, the edge of the linoleum curls up, a page of history begging to be turned. Splattered, brown grime creeps up in the crevice between the base of the cabinets and the well-worn flooring. This inevitably sends me into panic, a deep heaving, sweaty fear of mold and the other things that lurk in nooks and crannies. 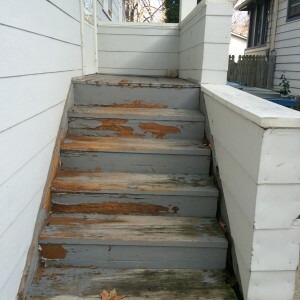 We have made small improvements on the house, ones that seem appropriate for those only leasing the property. There’s the shower; I cried the first time I used it. We worked for hours with an X-ACTO knife to remove the floral grips someone had stuck on the floor of the tub now outlined with black and dark shades of green. Drew squirted a squiggly line of caulk over the deep crack between the tub and shower wall. 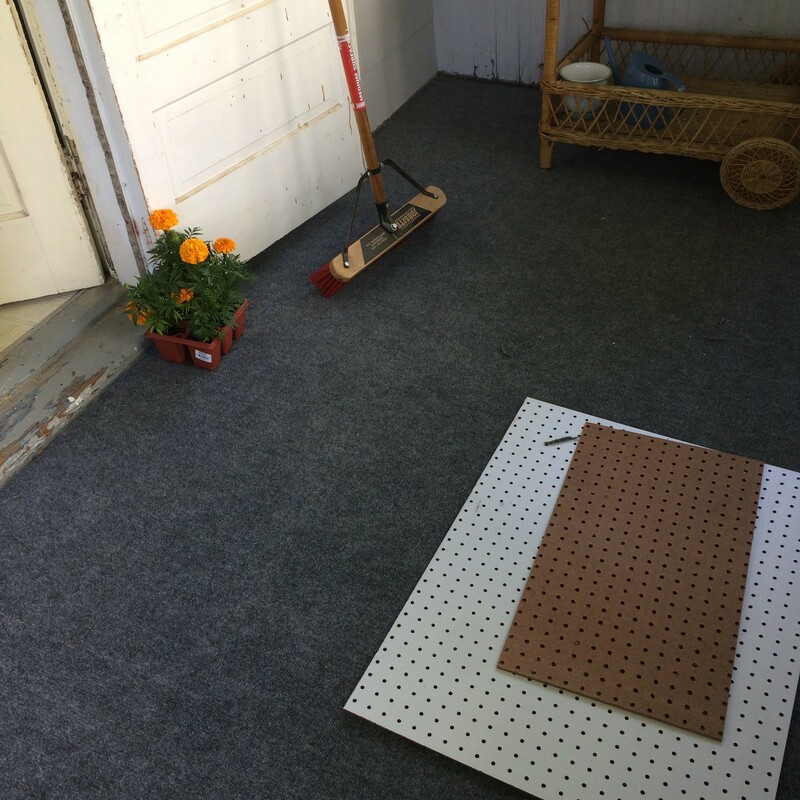 We tackled the back porch in the spring, removing the calico of welcome mats and rugs covering the floor and stapling down a single sheet of indoor/outdoor carpeting. We’ve replaced the light fixture in the bathroom, painted a yellow stripe around the wall in the dining room, and hung some heavy shelves on the plaster walls. And yet, sometimes even our elbow grease seems too much to give to this place that isn’t ours. The landlord seems determined to run his property into the ground, which is working because some of the house is literally sinking. I tire of the sense that I live a collapsible life, the kind I’ve lived since leaving for college. My existence feels cobbled together from Swedish-named IKEA parts, propped up picture frames, and other signs that I will leave each room without a trace. We will be renting for a long time. Financial experts have advised some millennials to never buy at all, offering online calculators and formulas to figure out if owning property makes sense in their financial bracket and geographical location. And now a baby is entering into this equation, and I’m more lost than ever. In the early days of sickness and fatigue, I’d lie in bed unable to tend to the everyday messes of dishes and dirty clothes. I watched shows on television where families knocked down walls and pried up carpet floors, installing subway tile backsplashes and farm basin sinks. I’d walk into our kitchen holding my breath to avoid the odor of the rotting vegetables going to waste from our CSA due to the preferences of my nausea-riddled stomach. I couldn’t even take care of this place, it’s crumbs growing greater than its charms. I resisted planning the nursery. I resisted the stacks of paper and piles of former teaching supplies. I refused to make this home. But a few weeks ago, a dear professor passed away at forty two, reminding me that we are all renters on this earth, exiles planting gardens and pouring cement foundations for temporary shelters. The night after Dr. Foster died, I moved closer to Drew in our bed, suddenly feeling like this might be our last moment on earth. 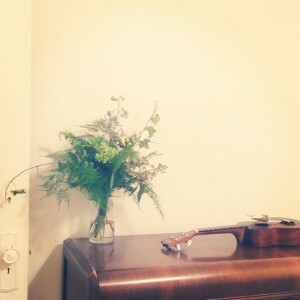 I realized how much I’ve held myself back from the places I’ve rented, refusing to be wasteful with transient things. But perhaps, in doing so, I’ve been truly wasteful, letting days and years slip through my fingers. I lay my palm across Drew’s chest and in his sleep, he lays his palm over mine. I feel his inhale and exhale of breath. Home is here, this bed could be anywhere. Why do I worry about the peeling linoleum or whether it’s worth it to paint the walls grey? Moving is in the future, now we are here, now I’m feeling Drew’s heartbeat and hearing the faint beginnings of his snoring. Part of me wants to stay up all night, feeling life in my love, but my pregnant body grows tired of my left side. I pry my hand from his sleepy grip and turn over, now listening for the rise and fall of my own breathing. As I drift off to sleep, time seems such a fleeting thing, and I resolve to make this our home, even if it feels like we’re squatters. Let’s dig a hole in the back yard, I think, and lose our security deposit because we danced so much on the floors they’ve bowed under the weight of our living and breathing. Let’s carve our names in the closet and leave the baby’s height etched into a doorway. Let someone else paint over our memories, let them last for a second as we throw the dust of this life as confetti. This entry was posted in Finding Place and tagged acceptance, adulthood, family, growing up, home, moving, renting. Bookmark the permalink. Oh Meredith, this is stunning. You have found (and now, shared) something beautiful in the midst of rotting linoleum. And your last image, the confetti-dust of life, will stick with me for a long time. You’ve given us new words for Carpe Diem. Thanks Jennifer! I’m glad for the monthly prompts to think about place and life and everything in between! This left me in tears. Beautifully expressed, Mere! Live life now to the fullest! Love dreaming about future kitchens together and also savoring the peeling linoleums and unstable ovens of the now : )! As someone who has also been a perpetual renter – I love this. Beautiful. Thanks Nicole! It’s certainly a different road then the one I plotted out as a dreaming teenager. I’m challenged daily to engage with the temporary. Hard but at times delightful!